A Form can be divided into Sections. 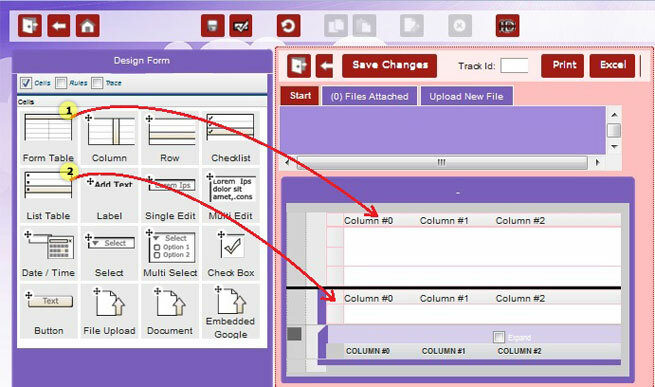 Sections help create forms, that are more clear and easy to read and understand. Sections can be created by allowing specific information to be grouped into tables on the form. 1. How to create Sections on a form? Fields can be grouped into Sections by dragging Tables on the form, and then adding fields to different rows of the tables. Different tables can represent different sections of the form. 2. What is a Form Table? A Form Table consists of a number of rows and columns, where each cell can be used to place items on the form. The number of columns and rows in the Form Table can be extended by dragging more rows and columns into the table. 3. What is a List Table? A List Table also consists of a number of rows and columns, where each cell can be used to place items on the form. A List Table also maintains a checklist table below the form which can be used to maintain a list of entities which can be marked, more like a list of products to be marked within the form. 4. How to add a Form Table and a List Table on the form? A Form table can be added on the form, by dragging (1) the Form Table item from the Design Form section. Similarly, a List table can be added on the form by dragging (2) a List Table item from the Design Form section. More rows and columns can then be added to the Form Table and the List Table, as required.